The 2019 Dodge Challenger SRT Hellcat. The drag nightmare of a 2018 Dodge Challenger SRT Demon was only planned for one model year, but its less powerful sibling isn’t going anywhere. 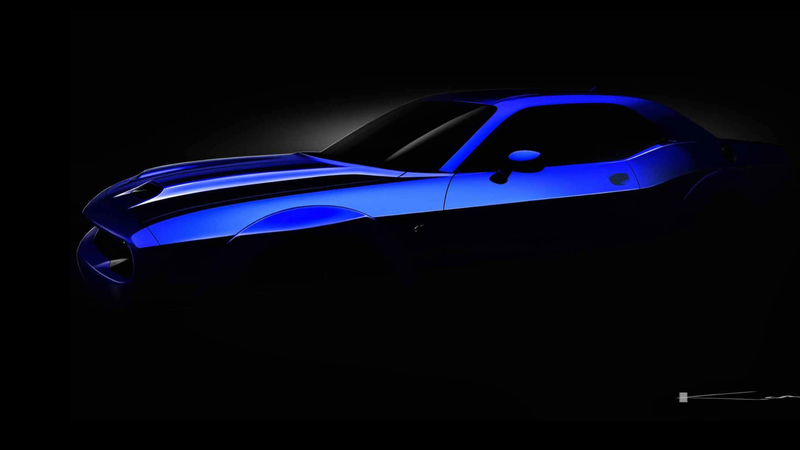 The 2019 Dodge Challenger SRT Hellcat is a go, and the first teaser images of the car show that it’ll have a full-on snout with dual snorkels on the hood. Can you practically see this thing breathing heavily like it’s about to stampede you? Yeah, same. It’s a machine of drag-strip destruction that now looks like one, too, and it’s terrifying—like a big, plastic, intimidating nightmare that you can’t wake up from. Mission accomplished on that one. But the hood is for more than scaring innocent passerby. Dodge didn’t say much about the 2019 Hellcat in a Wednesday press release on the car, other than that its “sinister” new hood is “pays homage to the distinctive Mopar design themes from some of its most famous muscle cars” from the 1960s and ‘70s. It also said the hood and its gigantic dual snorkels are fully functional, meaning there will be a lot of air intake into the monstrosity of an engine we can expect it to run. The fender flares in the teaser photo show that it’ll probably have some kind of widebody option, whether it’s a $6,000 performance package like it was on the 2018 Hellcat or standard on the car like it was on the 840-HP Demon. Without a new model year of the Demon coming out of the factory ready to destroy every (straight) road around, we could very well see a more intense baseline Hellcat. As for details on the Hellcat, we and the rest of the world will have to wait until summer to find out more. If anything, we know the power won’t disappoint.